'Game Night' Is Winning A breezily charming cast, ceaseless jokes and a tightly constructed script keep this film about a gaming night gone bad from going wrong. 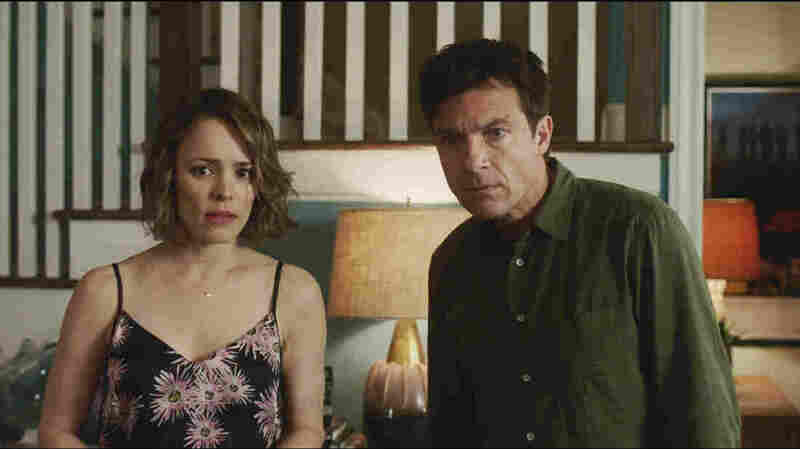 In Game Night, Annie (Rachel McAdams) and Max (Jason Bateman) spend a night as pawns in someone else's game. Restraint seems an odd word to apply to a film this crowded with car chases, gunplay, sneering bad guys, panicky good guys and one gleefully gruesome instance of ad-hoc, back-alley, gunshot-wound surgery. Neither Game Night's premise nor, by extension, its trailer, promises terribly much: Deeply competitive married couple Max and Annie (Jason Bateman and Rachel McAdams) host a weekly gaming gathering with friends, only to have it literally hijacked by Max's rich, overachieving and much cooler brother Brooks (Kyle Chandler). Masked toughs, who may or may not be part of an elaborate game, brutally kidnap Brooks while the assembled guests look on, eagerly sampling the cheese board. From there, the night proceeds to go violently awry. Where those previous films felt compelled to lunge for edginess (read: sneering raunch) as chaos dutifully descended on characters they didn't like very much – and weren't particularly interested in getting audiences to like, either — Game Night takes care to locate our sympathies with Bateman, and McAdams, and its cast of charming ringers. Casting isn't the only reason the film works as efficiently as it does, but it's probably the biggest. Catastophe's Sharon Horgan is on hand, and while she doesn't get a lot to do, she brings her familiar comic persona to bear. Ditto a blink-and-you'll-miss-her Chelsea Peretti. That turns out to be Game Night's pattern. After all, Bateman's not exactly playing against type, here: Beneath his competitive core, Max is a calm-headed Everyman who deals with erupting chaos by deflating it with bemused asides and the very mildest exasperation. Which is to say: He's back in Arrested Development mode. That's not a complaint, because Bateman's familiar presence unlocks the film in an interesting way; it seems to become an extension of his publicly perceived sensibility. Game Night trades on the comedy of ironic restraint, of de-escalation, of mundane conversations taking place against wildly violent, criminal, life-or-death backdrops. The pop-culture references, which are many, don't seem the product of some last-minute, punch-up-by-committee scripting session, they grow directly out of these characters' overdeveloped trivia acumen. Also, crucially: Screenwriter Mark Perez knows the difference between simply making a reference and actually writing a joke — and while the jokes come ceaselessly, they are knowingly and (this turns out to be key) lightly offered. Perez, and directors Daley and Jonathan Goldstein, also know that the tightly controlled light comedy taking place among the film's ensemble only works if the chaos it's contrasted against isn't truly chaotic. They've constructed a film in which the tension steadily escalates with at least a nod toward the logic of cause and effect, and characters make stupid but clearly motivated decisions. Game Night will likely get devoured this week at the box office, between Black Panther's momentous cultural moment and Natalie Portman's turn as a gun-toting, mutant-hunting super-scientist in Annihilation, but it doesn't deserve to disappear. It's neither groundbreaking nor career-making, but it manages to be smart even when it's being very dumb, and it's filled with the kind of surprise cameo appearances that trigger dumb grins of recognition and appreciation. That's still gotta count for something.